Sometimes it is difficult to find an audience for your book and the process is time consuming. But a recent opportunity came along that I couldn’t pass up. The Comfort, Texas, Public Library had its annual Read-A-Thon Saturday, March 30, 2019. I was invited to read and exhibit my book, At Home in the World: Travel Stories of Growing Up and Growing Away. A small but faithful crowd came to hear local community members read from their own book or a favorite – children and adult stories, scenes, essays, poetry; fiction and nonfiction. Caren Richardson of Fredericksburg (photo above and below) read poetry from different sources. The first was about a horse; therefore the reason for her painting of a horse at her feet below. 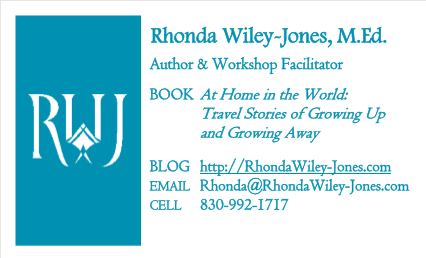 Along with my travel memoir, At Home in the World, I also took the Story Circle Network’s (SCN) recent anthology, Inside and Out. I have a published essay in the book. Carol Wichman (below right with her friend on the left) saw the SCN’s book and said she was a member who reviews books for the organization. She volunteered to review At Home in the World for hundreds of women readers across the nation who are members of Story Circle Network. Thanks, Carol!!! What a wonderful way of sharing my books and my writing in other publications with readers and writers alike. Thanks to the Comfort Public Library for this opportunity to promote my book. What other ways can you promote your book in local community events and venues? Share your ideas below with our readers. Thanks! Good idea. Promoting ourselves or our books is not easy. Promoting ourselves and our books demand time and effort, for sure, Letty.